^ a b Ward, Artemas (1911). 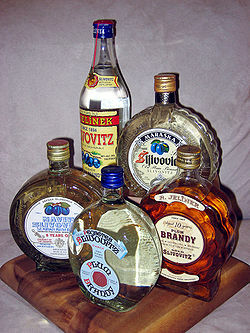 “Slivovitz”. The Grocer's Encyclopedia（英語版）. New York. pp. 567. http://digital.lib.msu.edu/projects/cookbooks/coldfusion/display.cfm?ID=ency&PageNum=575 2008年5月30日閲覧。. ^ a b Haraksimová, Erna; Rita Mokrá and Dagmar Smrčinová (2006). “slivovica”. Anglicko-slovenský a slovensko-anglický slovník. Praha: Ottovo nakladatelství. pp. 775. ISBN 80-7360-457-4. ^ Pokhlebkin, William (1992). “Appendix 5: The Raw Materials and Production Techniques of Other Principal Spirits of the World”. A history of vodka. London: Verso Books（英語版）. pp. 206. ISBN 0-86091-359-7. OCLC 28183139. Stephen Mennell (2005). Culinary Cultures of Europe: Identity, Diversity and Dialogue. Council of Europe. ISBN 9287157448, 9789287157447. http://books.google.com/books?id=1Dz0srxxDFoC. Grolier Incorporated (2000). The encyclopedia Americana. Grolier. ISBN 0717201333, 9780717201334.